A team of Institute for Marine and Antarctic Studies (IMAS) researchers has released the first-ever assessment of the economic and social benefits of Tasmania’s fisheries. The assessment analyses trends and changes in a range of both commercial and recreational fisheries where data is available, including abalone, commercial diving, giant crabs, rock lobster, scalefish and scallops. 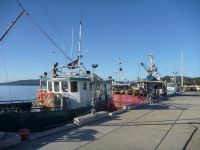 The number of quota units owned by investors based outside Tasmania (interstate or overseas) has increased to 23 per cent from zero in 1995 for lobster, and to 29 per cent from zero in 1985 for abalone, indicating a dispersal of the economic yield from these fisheries outside the State.